Thanks again to the Soulsby Farm for an outstanding feature about their little farm last week! This week’s “Tell Us Your Story” feature comes from the Thompson family from Coastal North Carolina. Karen and Eric share with us how they are living a more sustainable life on a budget. 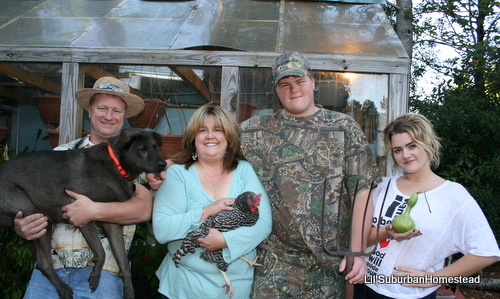 Their blog, Lil Suburban Homestead, ( http://lilsuburbanhomestead.wordpress.com/ ) focuses on their ability to grow, live and prosper as a family, as they follow their passion for homesteading. To follow along each week with our stories from all over, you can simply enter your email address on the right of our blog and click “follow”. Welcome to our Lil’ Suburban Homestead! We are the Thompson family and we live in Coastal North Carolina, where we know all about having to amend our soil and using buckets and planters to grow our own food! I am Karen Lynn and I am the blogger at our lil’ homestead as well as the Chicken Keeper, while my husband Eric is the Bee Keeper …..I call him the “Viking” in my life – an old nick name that was given at a former employer – and one that has stuck through the years! We are passionate about living sustainably on this earth! I was diagnosed with thyroid cancer in 2009. It was a very scary couple of years and our family faced other health problems as well. Finally, we faced the the stark reality that the food industry and the other powers that be were not interested in taking care of our health – and if we weren’t going to do it, no one else would. We decided that while we had always been interested in frugality and leaving less of an environmental foot print – we had to take things to an entirely new level. For us though we weren’t going to pick up stakes and move to the country to have our suburban homestead, we were going to bring the farm to us. At the time my daughter was a Senior in high school and my son was in elementary school – we were determined to hold out until both of our children graduated before we moved again. 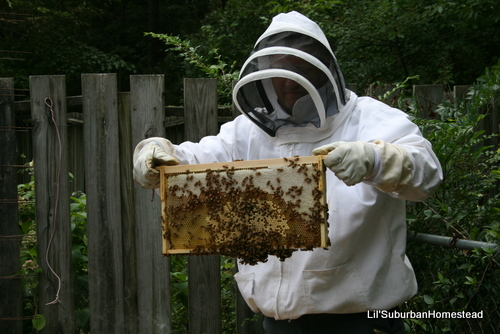 We may move eventually to a larger homestead as our hives and gardens expand. We also want to get goats soon have our own milk! My husband is the Visionary for our homestead. I only wish that I had half of his imagination and creativity. With him I believe that anything is possible! There is nothing that I ask of him that he won’t consider for our homestead. When I wanted a larger chicken coop he upgraded our old little coop to a larger one. We are thinking of using the old little coop to either house new chicks or even quail in. We only live on 1/3 of an acre in suburbia, so we have to have things extremely contained. 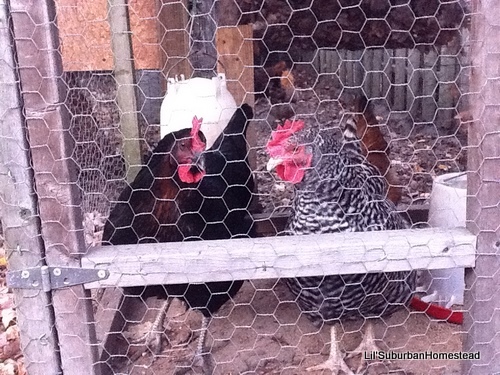 Our chickens are in a run and our bees are semi-fenced off. Luckily our neighbors are extremely understanding of our passions and yes, we do share some eggs. Soon, we will be sharing honey as well. We grow, cook and eat a lot of our own wholesome nutritious food. We also try to make our own homemade remedies that have been tried and true and have been around for centuries. 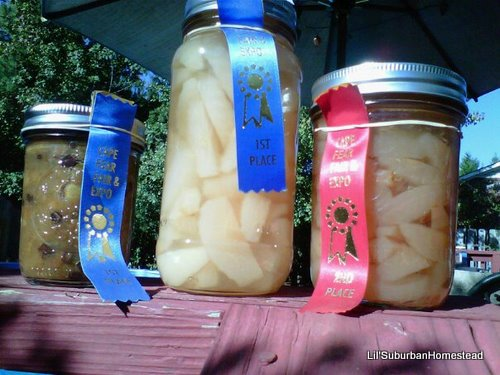 Eric's Award Winning Honey Pears! We can our own food, and yes, we even enter our goods in our local county fair. We want to encourage others to lead a more sustainable life! Maybe our ribbons might inspire someone? 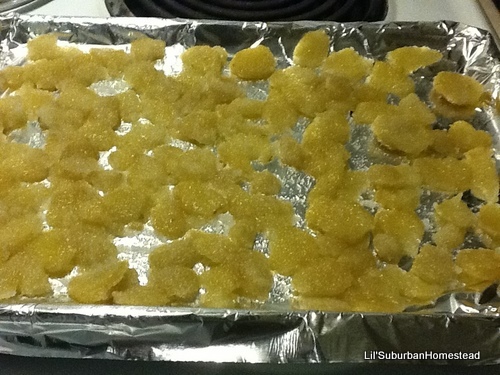 My husband made the honey pears in the middle that is his special recipe! We both work full time. My husband is a commercial HVAC sales person and mechanic, while I work supporting Technology and Web design at a local elementary school. We also are full time parents to our 14 and 19 year olds, who keep our lives hopping and busy too! We love going to our son’s football games and our daughter’s local performances (she is a musician). We also like to include both of our children in the planting and harvesting seasons as well. 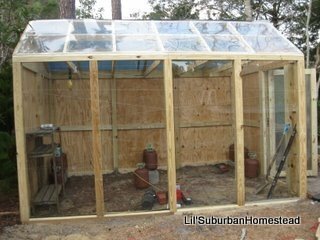 Another of Eric's building projects - the greenhouse! We are both involved in several Bee Keeping clubs and a local gardening club and on top of everything we love to go camping, boating, fishing, and collect mussels and oysters since we live so close to the beach! We would love for all of you to come visit our Lil’ Suburban Homestead anytime….come on over, hang out, and don’t forget to join our “Ole’ Saturday Homesteading Trading Post” blog hop every Saturday. 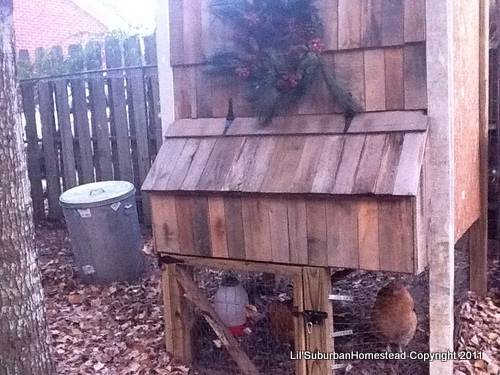 It’s a place to share what you are doing on your homestead! I am so glad Jim and Mary asked us to share our story because I am also going to post it on our About Me page so it will be permanently linked to their site as well!